ABSOLUTE BARGAIN! 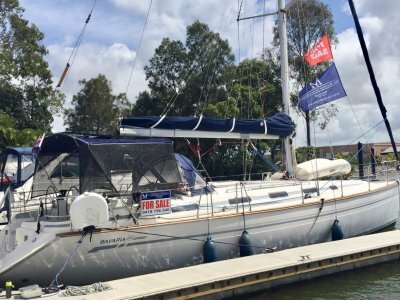 One Owner since new, beautifully presented and arguably the best quality brand coming out of the UK, her Melbourne based owner assures us that his fine vessel is in immaculate condition, kept by a professional crew. Boarding aft, there is a covered cockpit with plenty of seating and a table for outside dining. 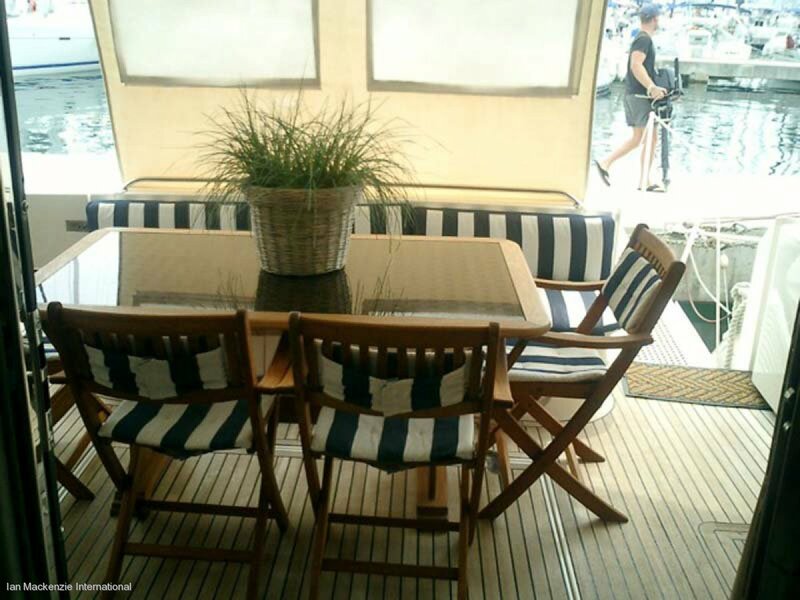 Steps lead up to the flybridge where upper deck seating is shaded by a bimini top. 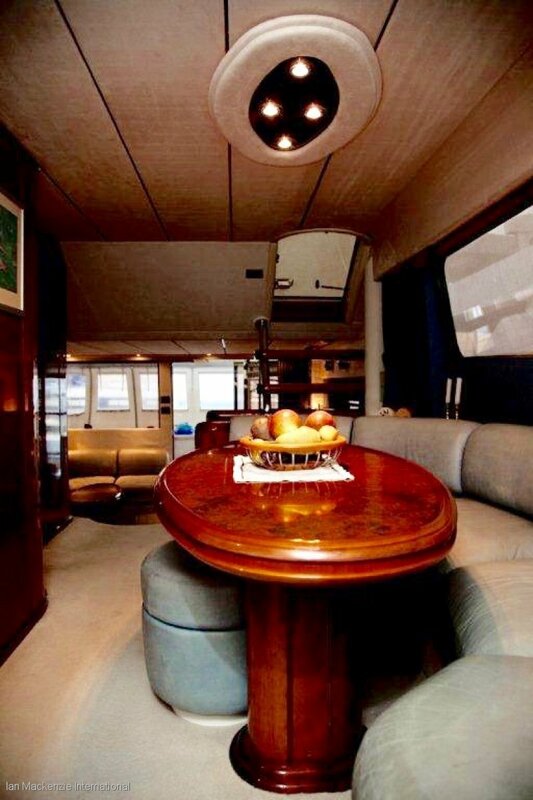 The main saloon has a lounge area with leather settees and a coffee table in front of the bar area and entertainment. Forward and up two steps is the separate dining area, again with leather settees. 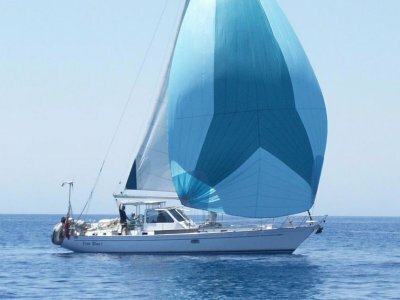 There is an L-shaped, well-equipped galley and forward helm. 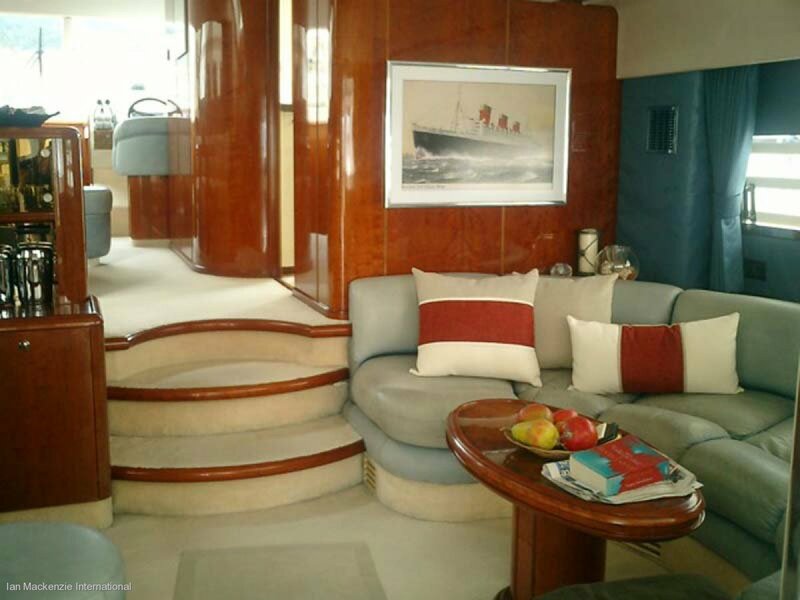 The staterooms and heads are below, with two crew cabins, one forward and one aft, each with separate entrances. 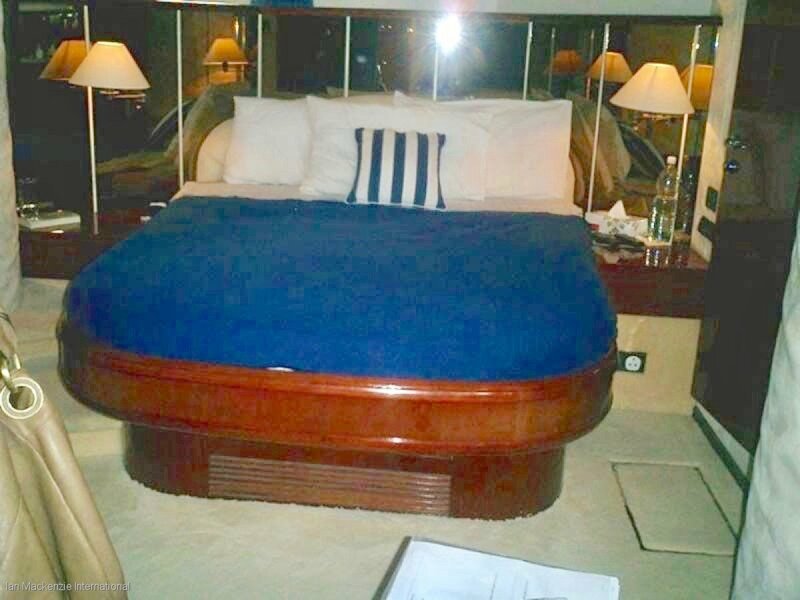 The vast Master stateroom is complete with settee and low table and the head boasts both a bathtub and a bidet. 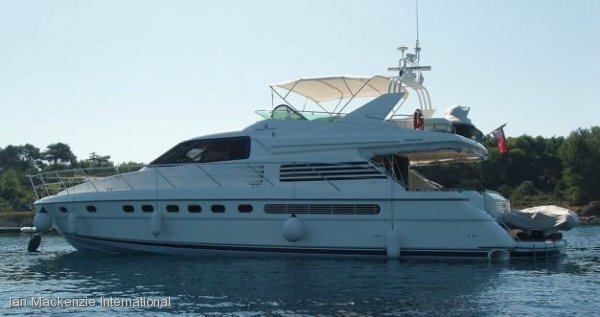 This is a big boat and has to be the best value Fairline Motor Yacht on the market today. Vessel is Australian Registered but not duty and tax paid as never been to Australia. 2 x MAN 1000 hp shaft drive diesels. Bowthruster. 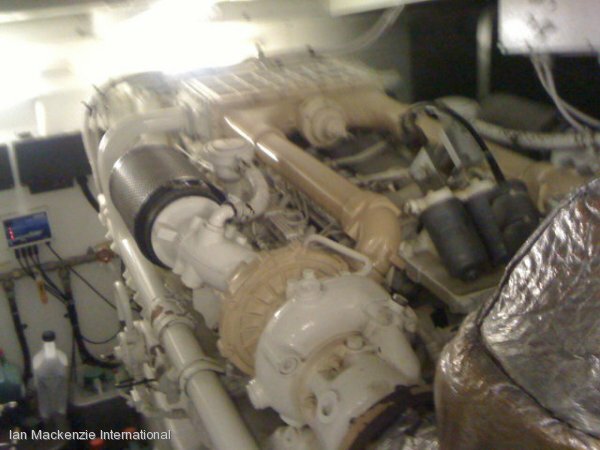 Engine room: The engine room is situated aft of the Master stateroom bulkhead and is easily accessible. 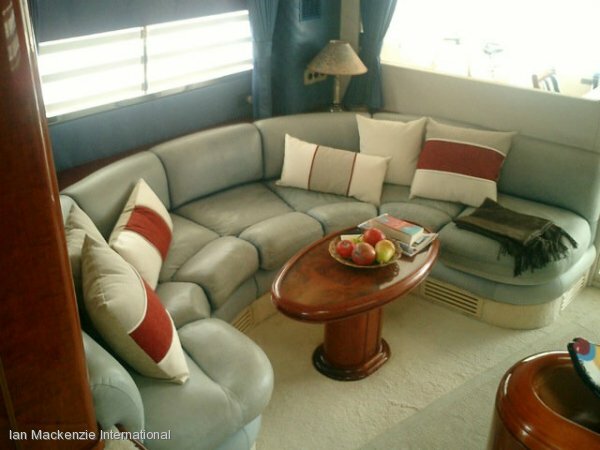 Leather upholstery in saloon and dining area. Separate lounge area with coffee table and entertainment, complete with large flat screen TV, cocktail cabinet and library. 3 Steps lead up to the dining area with oval table and wrap around seating. 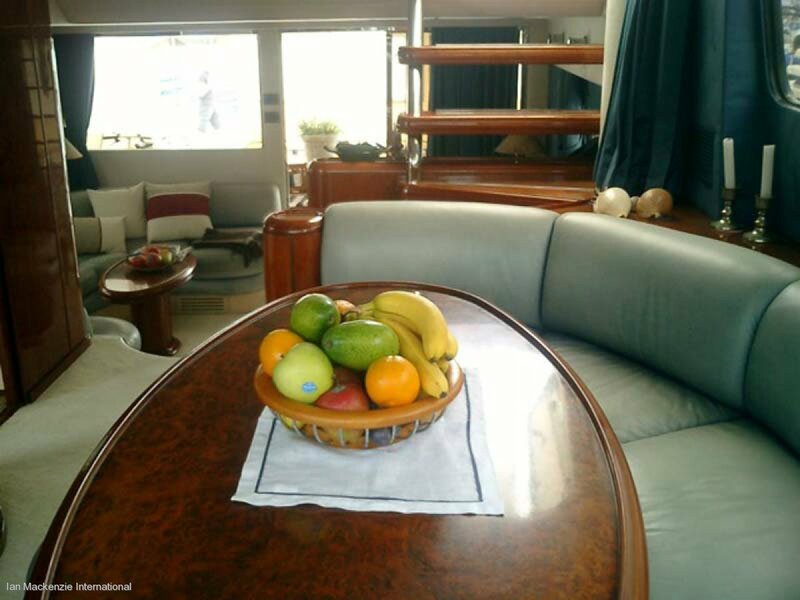 Galley is opposite and navigation station forward with 2 helm seats. 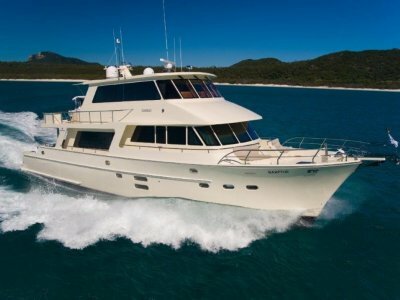 4 Guest staterooms accommodate 8 guests. Large Master suite has island queen bed with storage under and hanging lockers. Settee and coffee table. 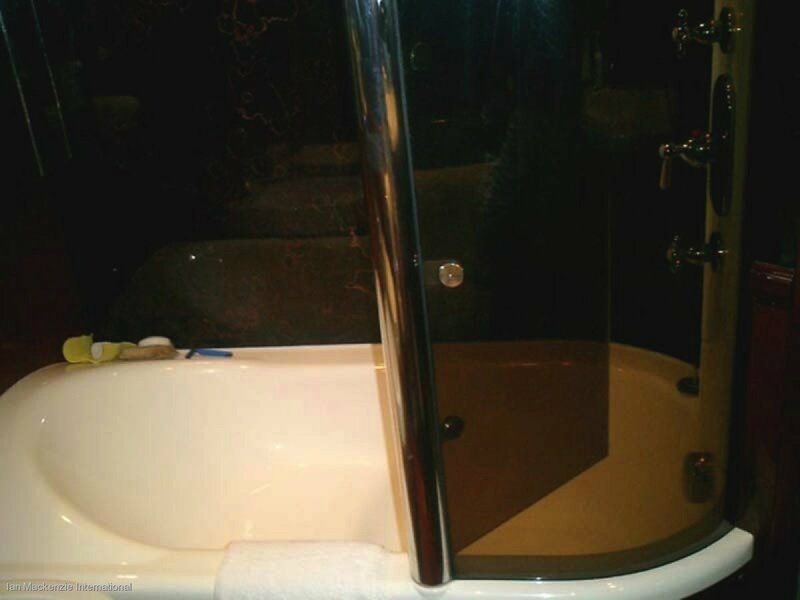 Ensuite with bidet and bathtub. 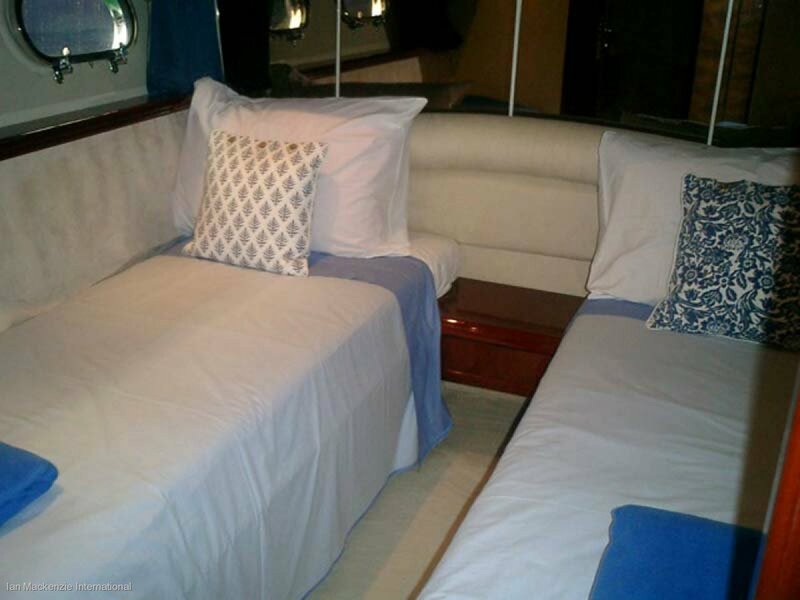 Guest island double with ensuite 2 doubles with island berths, 1 twin and 1 with bunks. 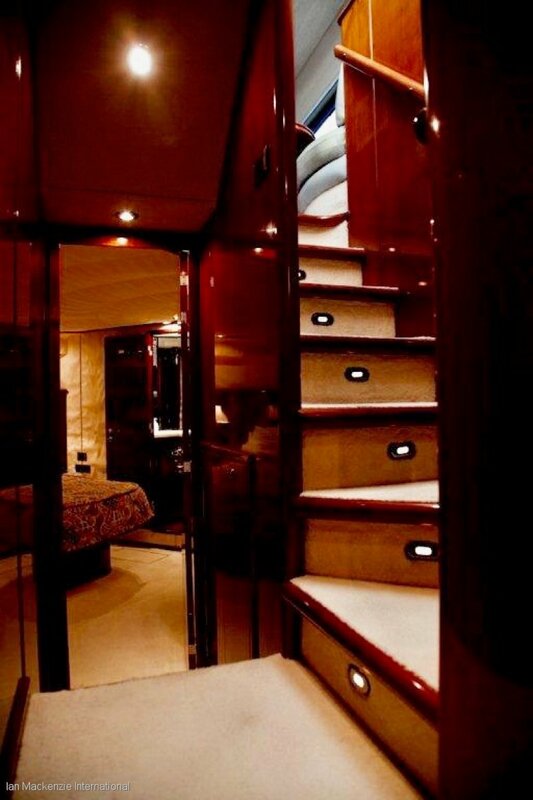 2 Crew cabins. 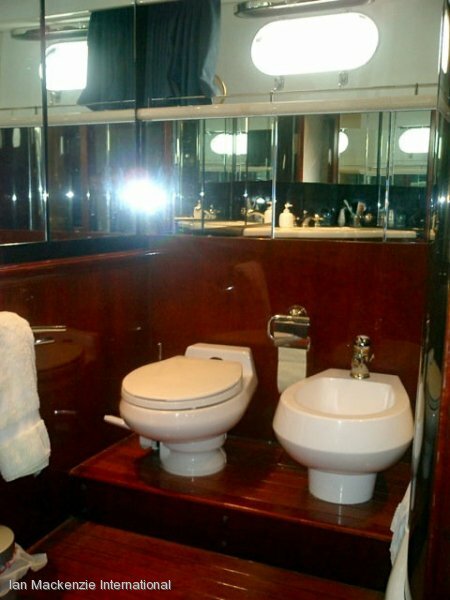 3 Guest toilets + 1 crew toilet plumbed to holding tank. Bidet in Master bathroom. Bathroom vanities with washbasins, mirrors and storage. 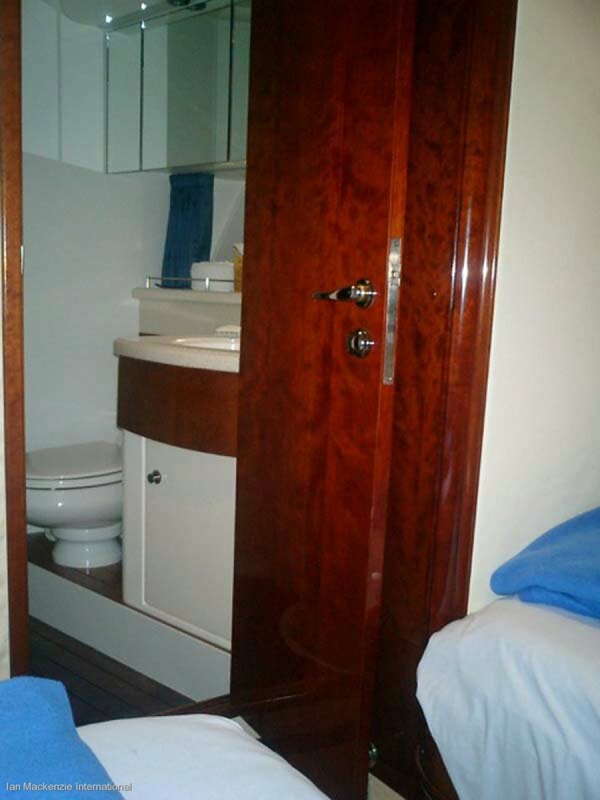 Ample storage lockers in spacious galley. Corian counter tops, stainless steel sink with mixer tap and sink cover, hot and cold pressurized water, microwave oven, extractor fan. Cutlery included. 4-Burner electric cooktop with multi function oven. Fridge and freezer in galley. 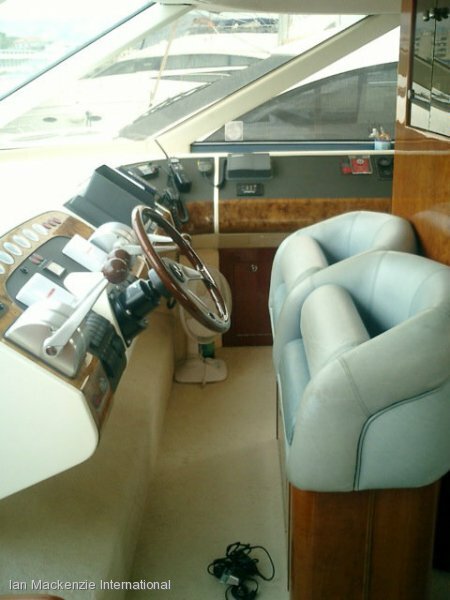 Fridge and ice-maker on flybridge. Air conditioning in all cabins. 12/24/220V systems, 2 battery chargers, huge battery banks. Electric BBQ on flybridge. Waterskis, Sea Doo XP 83hp (1998) jet ski, diving and snorkelling equipment. Cockpit table with seats and settee aft. Cockpit cushions. 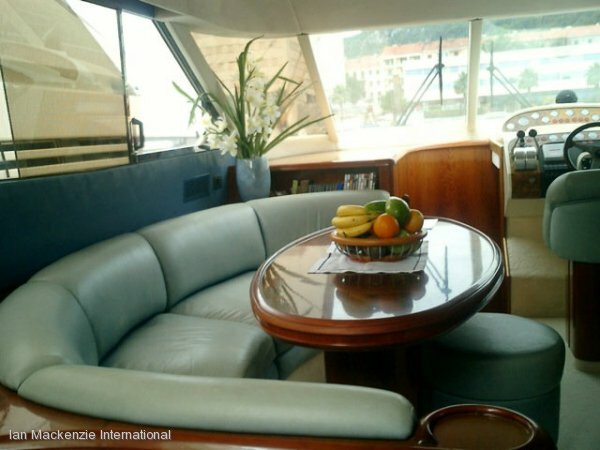 L-shaped settee and dining table on flybridge. 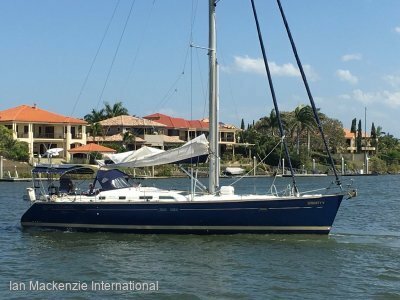 This fine vessel has been professionally run and maintained by the same skipper since new for this owner. 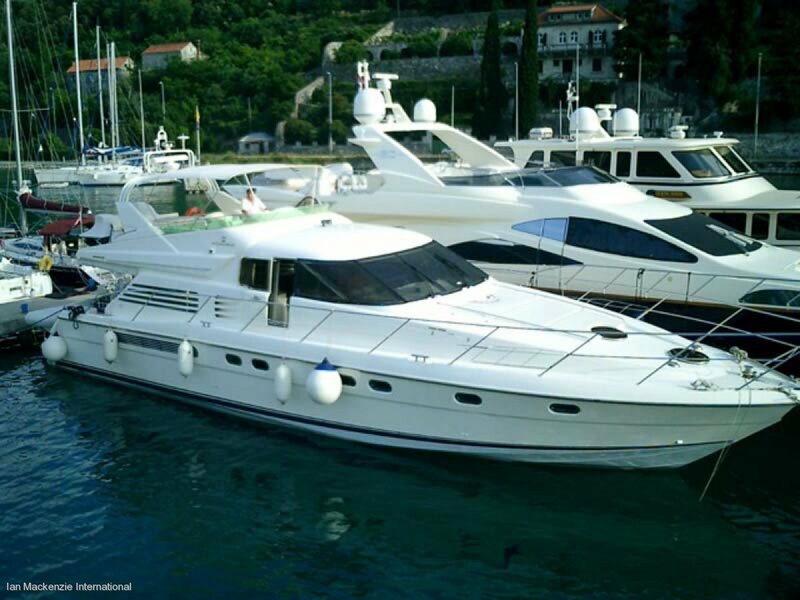 Located in beautiful Croatia, and priced to sell, consider her as your luxury apartment on the water that you can take you wherever your heart desires in the Mediterranean.. Greece, Turkey, Italy, French Riviera.. They're all just down the road. Contact us on Phone (07) 5502 3124. Celine Flamain 0429 867 913 Ian Mackenzie 0419 756 540.